evening, June 15’s State Final. Jakobs spearheaded a huge, 19-9 victory for LRHS, who recovered from a St. Dom surge late in the first half, then outpaced the Saints 11-3 in the downhill stretch to garner their first Class C crown. The Saints threatened early, ringing a shot off the Lake Region post in the opening minute; they didn’t, however, get on the board first. LRHS managed that, Jakobs curling in from the top of the St. Dom zone for an unassisted 1-0 with 22:59 still on the clock. St. Dom’s Caroline Castonguay answered less than a minute later, scoring on a free position; the Saints then hopped back on the attack, looking for a lead. The Lakers’ defense, though, stood strong: Senior Olivia Deschenes snapped the St. Dom attacking perimeter and shoveled the ball upfield, leading shortly to a 2-1 LRHS upper-hand. Play bounced end-to-end a few times after that, while Lake Region successfully killed off a yellow card for a hit to the head. Jakobs then busted up a St. Dom offensive foray and broke toward the Saints’ zone. Shortly, LRHS cranked it to 3-1, Rachel Shanks scoring on a redirect at the right side of the St. Dom cage. The Saints kept close, adding one just 33 seconds later. They continued to apply heavy pressure for the next several minutes, but the LRHS defense remained stalwart. First-half Lakers keeper Maddie Nelson turned an impressive save – one of several she turned, over the course of her tenure – at 12:37. From there, the Lakers began to pull away: The team logged a couple missed passes on offense around the nine-minute mark, but Jakobs picked up the last of those at the top of the St. Dom zone and curled in – like she’d done earlier – for another unassisted strike. 4-2. Mere seconds later, more Deschenes defense – she thwacked a St. Dom stick with her own, forcing a turnover – allowed Mackenzie Siebert to make it 5-2. The Saints quickly responded, 5-3, but Jakobs won the ensuing draw and dished to Bella Russo, who dished to Shauna Hancock, working possession ahead. Hancock fed to Lindsey Keenan, lurking behind the St. Dom net, and Keenan fed out front for Shanks, who slapped home 6-3. Lake Region charged to 8-3 in the waning minutes of the half; the Saints, however, refused to retire without a fight, and scored three – yes, three! – in the final 50 seconds. At the break, the outcome looked very much up in the air: Maybe LRHS weren’t going to run away with a W after all. St. Dom won opening draw of the latter half; they settled in for a short offensive spurt – but failed to capitalize and handed over control. Lindsey Keenan made it 9-6 on a free position, Jakobs 10-7 when she scrapped in from the left side, Shanks 11-7 on a redirect from the top right, and so on and so forth. As the game wended toward its close – the result looked more and more inevitable with each passing moment – LRHS demonstrated their lacrosse smarts. Comfortable in their advantage, they felt at ease searching out just the right opportunity to ratchet it up another notch. Shanks and Lindsey Keenan, for example, set up shop behind the Saints’ cage, where they burned seconds, minutes off the clock, simply playing pass; Jakobs lingered at the top of the Saints’ zone, occasionally taking a touch; other girls cut through the middle from the left and the right, generating options, options, and more options. The St. Dom defense tolerated the Lakers’ unhurried approach for far too long: For the team to have any hope of mounting a comeback, they obviously needed to pressure, to ply their trade far more aggressively than they were. But they never did, and Lake Region rolled to a crushing, 19-9 triumph. As mentioned, Jakobs put up seven goals in the outing – the high across both teams. Shanks added five goals, Lindsey Keenan three goals and five assists, and Bonenfant three goals and two assists. “Oh, jeez; I think everybody,” Coach Keenan said, asked which of his girls played well. “Really, literally: The entire defense did great; both goalies did great; Lauren Jakobs had the game of her season. Oh, my goodness, all the middies: Mackenzie, a freshman, Bella, a freshman, Aisley Sturk; Paige Davis did great. And then on offense, they always light it up: Rachel, Melissa, Lindsey and our freshman, Shauna Hancock.” Nelson split the game’s netminder duties with Emily Lake. Lake Region closes their year at 13-2. LRHS dropped their first game of the regular season to Yarmouth, and their last to Cape Elizabeth, but still claimed the tournament one-seed by roughly 23 Heal Points over St. Dom, the No. 2 entrant. The Lakers then downed both NYA and Freeport with seeming ease, ultimately earning their shot at the throne. 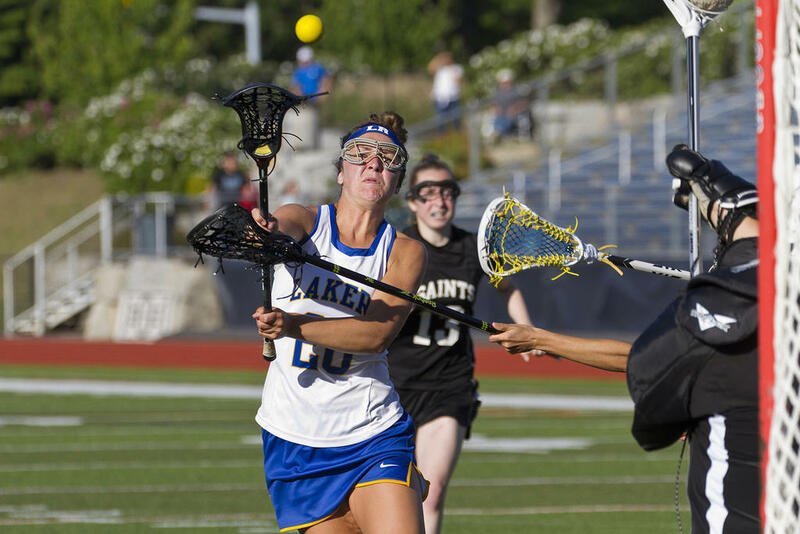 When Lake Region and St. Dom first clashed this year – back on May 9 – the Lakers emerged victorious 11-10 in double-OT. The Lakers featured 10 seniors this spring: 10 girls who’ve been playing together for many moons – as far back as fifth grade. The group helped launch the LRHS girls lax program a mere four years ago, and have now capped their high school careers in the happiest way possible. Besides Jakobs and Deschenes, Nelson, Sturk, Shanks, Bonenfant, Hailey Parsons, Lindsey Keenan, Isabelle Davis-White and Meghan Harmon are all Class of ’18. Lauren Jakobs unleases a successful shot on the St. Dom net. Rachel Shanks blasts a shot toward the St. Dom goal. Paige Davis, having shouldered past a St. Dom opponent, fires a pass forward. The Lady Lakers hoist their new State Championship trophy. Lakers – including Rachel Shanks (center) – lean out from the sideline, counting down the last few seconds before their victory is complete. Lakers coaches Carrie Bush (assistant) and Dave Keenan (head) step forward, their girls cheering them on, to present the team’s individual awards. The Lakers celebrate immediately upon winning Friday evening’s Class C State Championship. Incredulity shows on LRHS keeper Maddie Nelson’s face: She can’t quite believe she and her girls are State Champs. Melissa Bonenfant surveys her pass options. Rachel Shanks ducks past a Saints opponent. Lindsey Keenan battles in LRHS’s huge victory over St. Dom. Laker Lauren Jakobs chases down Saint Caroline Castonguay. Olivia Deschenes defends against a St. Dom attacker. Laker Allie Vogel hacks defensively at St. Dom’s Caroline Castonguay. Aisley Sturk fends off a Saints attack. Shauna Hancock powers forward, on the attack for Lake Region. Lindsey Keenan prowls the attacking perimeter for the Lakers. LRHS keeper Maddie blocks her net against an incoming shot. Mackenzie Siebert pushes past a St. Dom defender. Shauna Hancock trades looks with her teammates on the sideline as the Lakers’ final victory arrives.